1. Your Contract with The Dublin City Pub Crawl: To secure a booking requires a completed online booking form for each booking. Clients booking by telephone or email will be deemed to have read the booking conditions and accepted them. A booking is accepted and becomes definite only from the date when The Dublin City Pub Crawl has confirmed acceptance via email. It is at this point that a contract between The Dublin City Pub Crawl and the Client comes into existence. Before your booking is confirmed and a contract comes into force, The Dublin City Pub Crawl reserves the right to increase or decrease advertised prices. The Dublin City Pub Crawl reserves the right to decline any booking at their discretion. The contract, including all matters rising from it, is subject to Irish Law and the exclusive jurisdiction of the Irish Courts. No employee of The Dublin City Pub Crawl other than the managers has the authority to vary or omit any of these terms or promise any discount or refund. 2. All clients must be at least 18 years of age and in possession of valid identification. 3. Payment for Your Tour: The deposit and full payment paid is non-refundable. 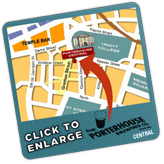 The balance of all monies due, including any surcharges applicable at that time, must be paid to The Dublin City Pub Crawl by the date specified for each tour. In the case of non-attendance The Dublin City Pub Crawl will treat the booking as cancelled by the Client. 4. Changes by You: Any changes to the original booking must be confirmed by email by the person submitting the booking. Whilst every reasonable effort will be made to accommodate changes and the additional requests, availability cannot be guaranteed. 5. Cancellation by You: The Client may cancel the booking at any time provided that the cancellation is communicated to The Dublin City Pub Crawl by email or telephone. Cancellations must be made at least one week before the booked date in order to receive a full refund. Cancellations made within one week of the booking will not result in any refund. If the agreed service is being provided, no refund will be given. 6. Changes by Us: While The Dublin City Pub Crawl will use its best endeavours to operate all tours as advertised, by entering into this contract the Client accepts that it may prove necessary or advisable to vary of modify a tour itinerary or its content due to prevailing local conditions. The Dublin City Pub Crawl reserves the right at any time to cancel or change any of the facilities, services or prices described in the advertising, and to substitute alternative arrangements of comparable monetary value without compensation and accepts no liability for loss of enjoyment as a result of these changes. If a major change becomes necessary The Dublin City Pub Crawl will inform the Client as soon as reasonably possible if there is time before the booking date. The definition of major change will depend on the individual tour and circumstances. When a major change is made the Client will have the choice of accepting the change or arrangements, purchasing another available tour or canceling. 7. Cancellation by Us: The Dublin City Pub Crawl reserves the right to cancel a tour in any circumstances but will endeavour to avoid this unless absolutely necessary. The Dublin City Pub Crawl tours will not occur if there are less than four people in attendance on the public offering. 9. Passports and Visas: It is the responsibility of the Client to be in possession of a valid passport and visa permit for the duration of the tour. Information about these matters or related items is given in good faith but without responsibility on the part of The Dublin City Pub Crawl. 10. Age, Fitness and Participation: The Dublin City Pub Crawl tours suit outgoing and energetic people. All Clients are expected to satisfy themselves prior to booking that they are fit and able to complete the itinerary of the tour. The Dublin City Pub Crawl reserves the absolute right to decline a booking at their discretion. Clients agree to accept the authority and decisions of The Dublin City Pub Crawl's employees, tour leaders, and affiliates whilst on tour with The Dublin City Pub Crawl. If, in the opinion of such person, the health or conduct of a Client before or after the departure appears likely to endanger the safe, comfortable or happy progress of the tour, the Client may be excluded from all or part of the tour. On The Dublin City Pub Crawl Clients large quantities of alcohol are often consumed. All clients are responsible for their own safety and well-being. The Dublin City Pub Crawl does not encourage any clients to engage in any dangerous activity or to drink excessively. The Dublin City Pub Crawl cannot accept any responsibility if the client drinks too much or engages in dangerous activities and suffers injury, illness, death, loss or damage as a result. 11. Irish Laws and Behaviour: All participants in tours operated by The Dublin City Pub Crawl are expected to obey Irish laws and regulations and any failure to do so will relieve The Dublin City Pub Crawl of all obligations that they may otherwise have under these booking conditions. Any damage or loss caused by a Client is the responsibility of the Client. Full payment for any such damage or loss must be paid at the time direct to the accommodation owner or manager or other supplier. If the Client fails to do so, the Client will be responsible for meeting any claims (including legal costs) subsequently made against The Dublin City Pub Crawl as a result of the Clients actions. The Dublin City Pub Crawl expects the Client to have consideration for other people. If, in The Dublin City Pub Crawl's opinion, any Client behaves in such a way as to cause or be likely to cause danger, annoyance or distress to any third party or damage to property, The Dublin City Pub Crawl is entitled, without prior notice, to terminate the tour of the Client concerned. In this situation, the Client concerned will be required to leave the tour. The Dublin City Pub Crawl will have no further responsibility towards the Client. No refunds will be made and The Dublin City Pub Crawl will not pay any expenses or costs incurred as a result of the termination. 12. Illness or Disability: Anyone suffering from illness or disability or undergoing treatment for any physical or medical condition must declare the true nature of such condition at the time of booking and make arrangements for the provision of any medication or other treatment required during the tour. Failure to make such disclosure will constitute a breach of these booking conditions and result in such persons being excluded from the tour in which case all monies paid will be forfeit. This will not prevent the Client from participating in the tour but will enable The Dublin City Pub Crawl to take additional precautions for the Client's safety at such times as may be appropriate. 13. If You Have a Complaint: If the Client has a complaint about any of the tour arrangements the Client must bring it to the attention of the tour leader at the time so that they may use their best endeavours to rectify the situation. It is only if The Dublin City Pub Crawl is made aware of any problems that there will be the opportunity to put things right. Failure to complain on the spot will result in the Client's ability to claim compensation from The Dublin City Pub Crawl being extinguished. Should the problem remain unsolved a complaint must be made in writing to The Dublin City Pub Crawl within 7 days of the completion of the service. 14. Our Responsibilities: The tours operated or supplied by The Dublin City Pub Crawl have been designed to provide participants with an exposure to the true nature of the environment visited and therefore involve an element of potential risk and exposure to potential hazards. All bookings are accepted on the understanding that such risk and hazards are appreciated by the Client and that they undertake all tours at their own volition.